D&W Fine Pack offers an array of food containers to attractively merchandise bakery, deli, prepared foods and produce creations with maximum eye appeal and freshness. Our supermarket packaging comes in a wide variety of sizes and presentations to beautifully showcase any product and promote your signature brand and generate impulse sales. 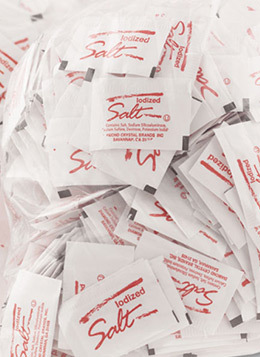 We have the packaging you need to entice customers, secure their loyalty and build business. 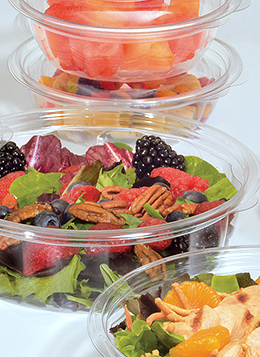 D&W Fine Pack’s grocery containers can easily accommodate any type of food product, including salads, produce, meats, hot and cold prepared foods, baked goods or specialty items. Manufactured to keep contents fresh and secure from store to table, these sturdy, efficient packaging options and configurations feature easy-close lids, a stackable design and divided compartments to make prep work easier and consolidate critical shelf space. Round, square or rectangular, hinged or two-piece combos, D&W Fine Pack containers preserve the integrity of food and offer multiple applications throughout the supermarket for product presentation, cooking and storage. 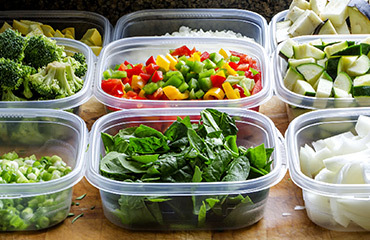 Clear and glossy-black containers are perfect to show off savory food choices in any department, while various material packaging keeps hot or cold foods fresher longer with superior insulating properties. Select packages can even be warmed or reheated in the microwave. When it comes to sustainability in food packaging, D&W Fine Pack has a complete line of environmentally responsible products that not only can improve your food presentation, but reduce your carbon footprint as well. These greener options provide the high-performance packaging features you demand using naturally occurring, recyclable materials that reflect your commitment to eco-friendly practices and sustainable product choices. 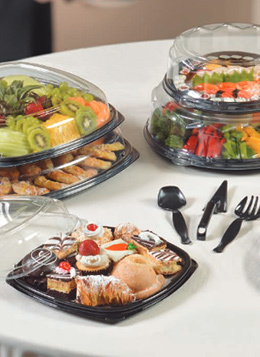 From fruit, deli, and salad containers to round cake pans and divided vegetable platters, there is quite an assortment of D&W Fine Pack single-use serving containers to choose from for packers and processors of food products. 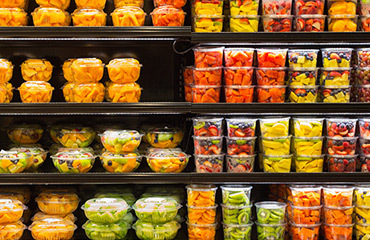 Crystal clear, glossy black and standard aluminum packaging in multiple sizes and styles meet today’s diverse menu options and consumer trends for grab-and-go or prepared meals. Liquid or solid, hot or cold, clear or shiny, however your food is processed, served or presented, D&W Fine Pack has the material packaging that’s right for whatever the substance, temperature or application of your product. 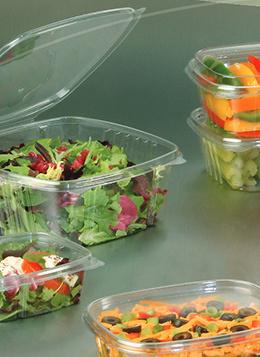 Our food containers use PETE, PP, PS, OPS and PLA for optimum integrity, performance and display. And we offer several lines of sustainable packaging made from renewable or biodegradable materials for eco-conscious producers. D&W Fine Pack’s durable, reliable packaging keeps processor meals and foods fresh, intact and secure, whether stacked on display shelves, transported to and from the store or reheated and served at home. 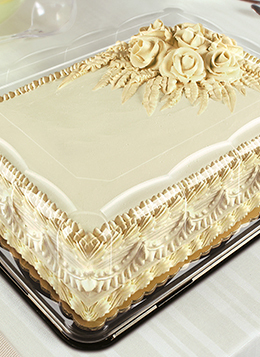 Multiple barrier, fluid-retention and insulation properties are ideally suited for varied food types, preventing leakage and ensuring contents stay warm or cold without affecting handling. Snap-tight lids and tamper-evident options meet safety and portability requirements. When it comes to cost-effectiveness and time-efficiency, D&W Fine Pack’s packaging products include specifically designed features to improve overall food packing and processing operations, including handling, preparation, storage and transport. To better manage costs, value-driven products, such as our aluminum containers, offer an economical solution for volume feeding. Divided serving pieces offer precise portion control, while options like common lids and smaller case counts reduce inventory and storage.